The British Journal of Pharmacology is a biweekly peer-reviewed medical journal covering all aspects of experimental pharmacology. It is published for the British Pharmacological Society by Wiley-Blackwell. It was established in 1946 as the British Journal of Pharmacology and Chemotherapy. The journal obtained its current title in 1968. The editor-in-chief is Amrita Ahluwalia. Previous editors-in-chief include Ian McGrath, Humphrey Rang, Alan North, Phil Moore, Bill Large, and Tony Birmingham. A sister journal, also published for the British Pharmacological Society by Wiley-Blackwell is the British Journal of Clinical Pharmacology. The journal publishes research papers, review articles, commentaries and correspondence in all fields of pharmacology. It also publishes themed issues, as well as supplements. The Concise Guide to PHARMACOLOGY is a supplement of the British Journal of Pharmacology, replacing the "Guide to Receptors and Channels". It is produced in association with the Nomenclature Committee of the International Union of Basic and Clinical Pharmacology. The current version, The Concise Guide to PHARMACOLOGY 2013/2014, was published in December 2013, and edited by Stephen Alexander, Anthony Harmar, and John Peters. This edition is a compilation of the major pharmacological targets divided into seven sections: G protein-coupled receptors, ligand-gated ion channels, ion channels, catalytic receptors, nuclear receptors, transporters, and enzymes. These are presented with nomenclature guidance and summary information on the best available pharmacological tools, alongside suggestions for further reading. It is freely available online and also available in hard copy. Previous editions of the "Guide to Receptors and Channels" are available through PubMed Central. The content of the "Concise Guide to PHARMACOLOGY" is also available through the online portal Guide to PHARMACOLOGY. According to the Journal Citation Reports, the journal has a 2014 impact factor of 4.842, ranking it 24th out of 254 journals in the category "Pharmacology & Pharmacy". 1 2 3 4 5 6 "British Journal of Pharmacology". Ulrichsweb. ProQuest. Retrieved 2014-12-18. (subscription required (help)). 1 2 3 "Master Journal List". Intellectual Property & Science. Thomson Reuters. Retrieved 2014-12-27. ↑ "Serials cited". CAB Abstracts. CABI. Retrieved 2014-12-27. ↑ "CAS Source Index". Chemical Abstracts Service. American Chemical Society. Retrieved 2014-12-27. ↑ "CINAHL Complete Database Coverage List". CINAHL. EBSCO Information Services. Retrieved 2014-12-27. ↑ "Serials cited". Global Health. CABI. Retrieved 2014-12-27. 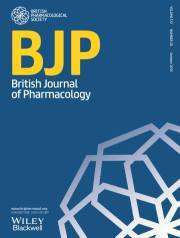 ↑ "British Journal of Pharmacology". NLM Catalog. National Center for Biotechnology Information. Retrieved 2014-12-27. ↑ "Serials cited". Tropical Diseases Bulletin. CABI. Retrieved 2014-12-27. ↑ "Journals Ranked by Impact: Pharmacology & Pharmacy". 2014 Journal Citation Reports. Web of Science (Science ed.). Thomson Reuters. 2015.